According to OSHA, slips, trips, and falls are among the most common causes of workplace injuries. Good housekeeping practices are essential in the workplace and reduce the potential for slip, trip and fall incidents. OSHA General Industry Standard 1910.22(a)(1) states that the employer must ensure: All places of employment, passageways, storerooms, service rooms, and walking-working surfaces are kept in a clean, orderly, and sanitary condition. OSHA defines a walking/working surface as any horizontal or vertical surface on or through which an employee walks, works, or gains access to a work area or workplace location. 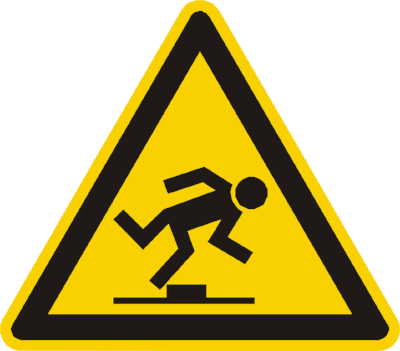 Slips occur when there is too little friction or traction between your feet (footwear) and the walking or working surface, and you lose your balance. Trips occur when your foot (or lower leg) hits an object and your upper body continues moving, throwing you off balance. If repair or maintenance is required to remove the identified slip, trip or fall hazard, and the fix cannot be made immediately, the hazard must be guarded to prevent employees from using the walking-working surface until the hazard is corrected or repaired. Short-term hazards due to maintenance, repair or housekeeping should be marked with cautionary floor stands or signs, barricade tape, warning posts and/or chains. OSHA General Industry Standard 1910.22(a)(3) Walking-working surfaces are maintained free of hazards such as sharp or protruding objects, loose boards, corrosion, leaks, spills, snow, and ice. It is recommended that a safety meeting on slips, trips and falls be conducted with all staff at least once a year. During the safety meeting, make sure to cover these important points to prevent slips, trips & falls in the workplace. Always clean up spills immediately and post wet floor warning signs when appropriate. Keep cords, cables, material and equipment out of the walkway and keep doorways unobstructed. Use non-skid or anti-slip coatings on work surfaces and only use non-slip floor mats. Ensure good housekeeping is maintained. Wear proper slip-resistant footwear when working on or around potentially slippery surfaces. Walk cautiously, pay attention to the path ahead and avoid running. When taking the stairs, only take one step at a time and always use the handrail. Do not carry items which obstruct your view when you are walking. Never stand on a chair to reach up high, always use a ladder. Always close all drawers and cabinets immediately after use. Ensure all walking/working areas have adequate lighting including stairwells, closets & passageways. Use heavy-duty, highly visible warning tape and floor tape to mark any uneven floor surfaces. Inspect ladders and scaffolding regularly and before every use. Use signs where there could be a need for instructions or suggestions like “Watch Your Step”. Exits must be visible and clearly marked with an EXIT sign. Stairs and landing areas should be marked with anti-skid floor tape. Warehouse with good housekeeping and a designated aisle way. A membership to Weeklysafety.com comes at a very low price that never goes up no matter how many employees you have and no matter how many awesome safety topics you use. You don’t need any fancy software, employees don’t need to download an app, and it's very easy to get started. Included in your membership are hundreds of safety topics that you can use for your safety meetings, toolbox talks and safety moments including a safety meeting topic like this one that covers Slips, Trips & Fall hazards in the workplace.